The United States Congress designated the Pine Valley Mountain Wilderness (map) in 1984 and it now has a total of 50,216 acres. All of this wilderness is located in Utah and is managed by the Forest Service. A mountain island surrounded by desert, Pine Valley Mountain Wilderness preserves numerous lush meadows (up to 50 acres in size) and a beautiful forest of Engelmann spruce in the south, and spruce mixed with fir, pine, and large stands of aspen in the north. The Pine Valley Mountains rise through the entire center of the area and provide habitat for chipmunks, marmots, red squirrels, and a large herd of deer in summer. 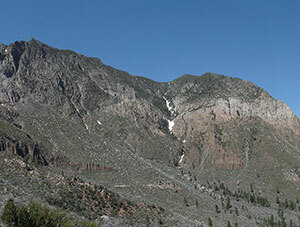 Elevations rise to a high point at 10,365 feet on Signal Peak in the southern portion. On a clear day at this site, you can see Zion National Park across Interstate 15 to the west, and some of Arizona's highest mountains to the south. Several springs fill numerous perennial creeks. Snow falls October through March, followed by a relatively dry and pleasant period that ends with a season marked by typically violent storms from July through September. The Summit Trail follows the crest of the Pine Valley Mountains in their north-south ramble for a distance of about 18 miles, and at least eight other trails climb the mountains to join the crest, including the easily accessible Whipple Trail (six miles). The Wilderness, Utah's second largest, lies within a much larger undesignated wild and free recreation area, bringing the total mileage of maintained trails to more than 151. Planning to Visit the Pine Valley Mountain Wilderness? How to follow the seven standard Leave No Trace principles differs in different parts of the country (desert vs. Rocky Mountains). Click on any of the principles listed below to learn more about how they apply in the Pine Valley Mountain Wilderness.